A stay at Casa de Carmona places you in the heart of Carmona, within a 5-minute walk of Santa Maria la Mayor Church and City Museum. This 5-star hotel is 18.9 mi (30.5 km) from Fibes Conference and Exhibition Center and 22.4 mi (36.1 km) from Alcazar. Treat yourself to a stay in one of the 68 individually furnished guestrooms, featuring private pools and private spa tubs. Complimentary wired and wireless Internet access keeps you connected, and satellite programming provides entertainment. Conveniences include safes and desks, and housekeeping is provided daily. 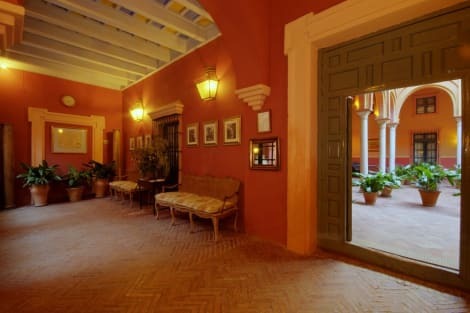 Located in Carmona, Parador de Carmona is within a 15-minute walk of Santa Maria la Mayor Church and Alcazar de Sevilla Door. This 4-star hotel is 19.3 mi (31.1 km) from Fibes Conference and Exhibition Center and 22.8 mi (36.8 km) from Alcazar. Located in the historical town of Carmona, the hotel enjoys an ideal location where guests can forget about their car and discover the many corners of this beautiful city either on foot or by bike. It is within a 5-minute walk from Via Augusta and the Alcázar of Seville, 800 metres from the Alcázar of the King Don Pedro and the surrounding area houses a large selection of open-air restaurants, typical tapas bars and shops- ideal for a leisurely stroll before dinner. The hotel dates to the 14th century and offers a charming mix of modern comforts and family-friendly atmosphere. Each of its rooms is personalized with the names of the main Roman towns in the surrounding Carmona Via Augusta and maintain its original charm updated with the best comfort for a truly optimal stay. Offering a seasonal outdoor pool and terrace, Frenteabastos Hostel Suites Lounge Cafeis located in Carmona in the Andalucía Region, 33 km from Seville. Guests can enjoy the on-site bar. Every room has air conditioning and a flat-screen TV. Some units include a seating area for your convenience. The rooms have a private bathroom. You will find a shared lounge at the property. Écija is 50 km from Frenteabastos Hostel Suites Lounge Cafe, while Constantina is 45 km from the property. Seville Airport is 24 km away. This comfortable country house hotel is located directly in the holiday resort of Carmona and is around 15 km from Seville, which offers a variety of shopping venues as well as countless restaurants, bars and entertainment venues. Renovated in 2004, this hotel comprises 18 rooms of which 1 is a single room and 17 are double rooms. Facilities on offer include a foyer with a 24-hour reception desk, a safe, a currency exchange facility and a café. There is also a bar, TV room and air-conditioned à la carte restaurant. Furthermore, a conference room, a public Internet terminal, room service and medical assistance as well as a car park and a garage can also be taken advantage of. The hotel also has its own beautiful garden, where guests are invited to while away the hours. The exclusively furnished rooms come with an en suite bathroom, a hairdryer, a direct dial telephone, satellite/ cable TV, a radio, a hi-fi stereo system, a minibar/ fridge, central heating and a hire safe. Leisure options include a freshwater swimming pool, sun loungers, parasols, a Jacuzzi, a sun terrace, a steam bath and a massage service. It is quite easy getting to El Rincón de las Descalzas Hotel as it is situated in the very centre of Carmona, just 25 km from Seville. Its rooms are connected by flowered patios and picturesque paths smelling of orange blossom and incense, with the calming sound of the fountains on the background. Calmness and reminiscences from the past combined with modern comfort and luxury. Thirteen architecturally different and individually decorated rooms. There is free Wi-fi in the Hotel **** IN CASE OF ENTRY INTO THE HOTEL LATER THAN 20:30 NEED TO COMMUNICATE DIRECTLY TO THE HOTEL AND CALL IN ADVANCE. lastminute.com has a fantastic range of hotels in Carmona, with everything from cheap hotels to luxurious five star accommodation available. We like to live up to our last minute name so remember you can book any one of our excellent Carmona hotels up until midnight and stay the same night.